Fluffy, golden, crisp, and packed with flavor, this recipe puts a new spin on vegan French toast! Cooks up in minutes and perfect with your favorite savory toppings. 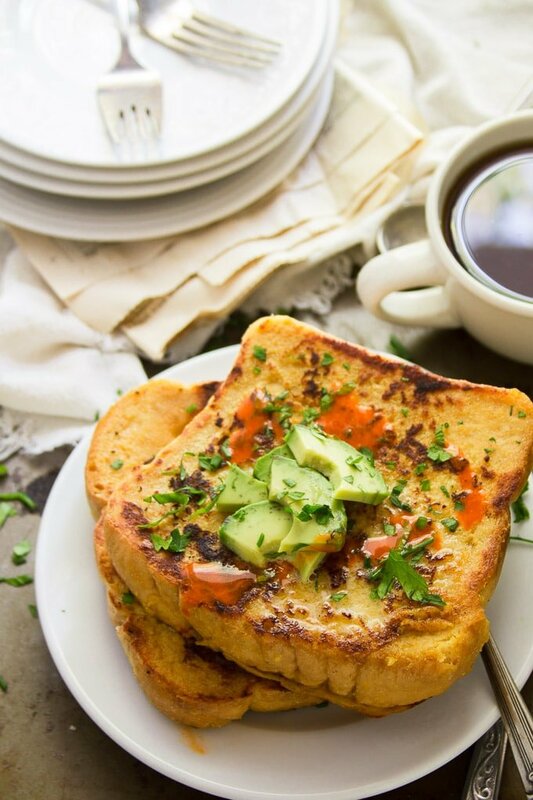 A few months ago I posted a recipe for vegan French toast and I got a bunch of requests for a savory version. This was the first time anyone asked for that, even though I’ve posted multiple versions of vegan French toast in the past. Anyhow, I’ve never had savory French toast. But I did my research and from what I can gather, it’s pretty similar to its sweeter counterpart. Just, you know, without the extra sugar and accompanying seasonings like vanilla or cinnamon. My savory vegan French toast starts out with a batter that’s similar to the one I used for my classic vegan French toast, but instead of cornstarch, I thickened this one with chickpea flour, because chickpea flour makes an excellent egg substitute that also happens to have a nice savory flavor. Whisk the batter together and dip your bread slices in it. Pan-fry the slices in some oil, just until golden and crisp on each side. The other thing about savory French toast: savory toppings are crucial! I went with avocado, chives and hot sauce, but vegan cheese, salsa, your favorite herbs, or some vegan gravy are some other delicious options.